Twice a year the circus that is the world of high fashion trundles its way around America and Europe. You probably can’t afford the couture clothing of the rich and famous, but that doesn’t stop you having some voyeuristic fun. So, in no particular order, here are five of the best fashion films out there. Director Stanley Donen’s gossamer light musical comedy proves that even as far back as the 1950s the public was obsessed with the gilded world of beautiful models, bitchy magazine editors and temperamental photographers. This story of a young girl plucked from obscurity by a scheming editrix and her top shot fashion photographer shares endless similarities with the cutthroat magazine business and refined echelons of couture. Which is hardly surprising as the character of the editor (infused with haughty indifference by Kay Thompson) was rumoured to be modelled on real-life fashion legend Diana Vreeland, whilst the inspiration for Fred Astaire’s photographer apparently derived from super snapper Richard Avedon. As for Audrey Hepburn in the role of the waif-like girl, catapulted to stardom by the medium of glossy magazines? She glowed as the feisty yet impressionable youngster in a film which, like the world of high fashion which it depicts, has stood the test of time thanks to its effortless style, wit and sophistication. There was never any in-between with Diana Vreeland, the eccentric fashion editor whose career at American Harper’s Bazaar and later its arch rival Vogue, spanned five decades between the 1930s and 1970s. As the documentary Diana Vreeland: The Eye Has to Travel proves, you either loved her or hated her. Written and directed by Lisa Immordino Vreeland, Brent-Jorgen Perlmutt and Frédéric Tcheng, this film feels like a fast flick through one of the magazines Vreeland edited. Spliced with archive interviews with the woman herself discoursing on her colourful life, it follows her from a childhood in Paris at the opening of the 20th century to her career at Bazaar and Vogue, before she reinvented herself as custodian of The Metropolitan Museum’s Costume Institute. The woman who makes Anna Wintour appear a pussycat in comparison, jumps from the screen in an acidic and gossipy cocktail which gives a fascinating insight into the career of one of fashion’s true icons. The interest surrounding this fly-on-the-wall documentary was as intense as that which shrouds the hallowed couture houses of Chanel and YSL. 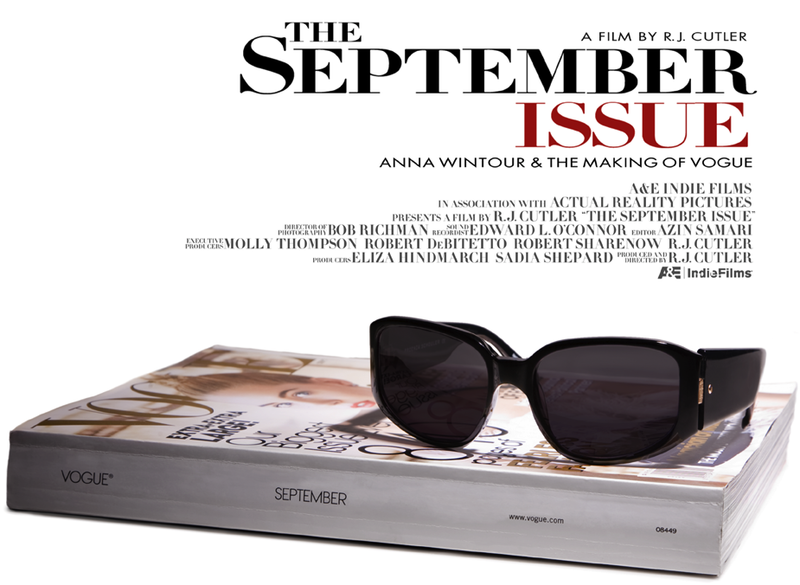 Sold as a chronicle of the editing process of American Vogue’s biggest ever issue, the September 2007 edition, there was really only one reason people watched it. To see whether the magazine’s notorious editor, Anna ‘nuclear’ Wintour, was as bad as she’s rumoured to be, and whether the similarities between her and the character of Miranda Priestly from the hit novel The Devil Wears Prada (reputedly based on Wintour) were mere fiction. Answer? Yes, though her legendary dismissal of anything (staff or clothes) that doesn’t meet with her exacting standards was shown to be leavened with fairness and a total dedication to the Vogue brand. Oddly the one thing (or person) that everyone remembered was not Wintour, but rather her flame haired second-in-command Grace Coddington. As mysterious and alluring as Vogue itself, the magazine’s Welsh born Creative Director was the star of the show, displaying a sophistication, style and wit which few in the world of fashion, or anywhere else for that matter, could hope to emulate. The world of fashion is peopled with numerous colourful characters, several of whom feature in this engrossing documentary on one of the industries true individuals. In an environment where people make their mark by standing out from the crowd, photographer Bill Cunningham sustained a long career as a chronicler of fashion and street life for The New York Times, by doing just the opposite. His secret – which for over thirty five years allowed him to capture the evolving history of style as it unfolded around him – was been his ability to immerse himself in it, yet remain refreshingly unaffected. Through candid discourse with Cunningham’s friends, employers and neighbours, as well as those he featured in his often blunt street shots, this film by documentary-maker Richard Press attempts to decipher photographer’s illusive appeal. Whether it’s successful in this aim is open to debate. However there’s no denying the result is as stimulating and fascinating as its enigmatic subject. Qui êtes-vous Polly Maggoo? (Who Are You, Polly Magoo?) is a veritable French fancy, as avant-garde as the space age creations modelled during its opening sequence. Shot like a pseudo documentary the film follows the eponymous Ms Magoo, an American fashion model, as she is pursued not only by the makers of the television show ‘Qui êtes-vous’ in which she is to feature, but also by the prince of a small Soviet bloc country who has his own designs on the ‘girl of the moment’. More than Polly and her escapades however, it is the fashion show that introduces the film which is truly astounding. This obscurity of 1960s cinema is worth watching for this alone, as it sums up everything about the fashion world in the space of six minutes. Here eccentric editors fawn over unwearable clothing, created by an egotistical designer and worn by emaciated models in a setting which is, quite literally, from another planet. All this set to a soundtrack of choral music makes for a piece of celluloid imagery as haunting and exquisite as anything you’d see on the catwalks of Paris or Milan.